I was all excited to make something different for dinner last evening. Running through in my head the vegetables that were sitting in the kitchen. The two little beetroots came to my mind. I decided to make beetroot burger but yet didn’t want any carbo in the night thus decided to try and be a little creative. 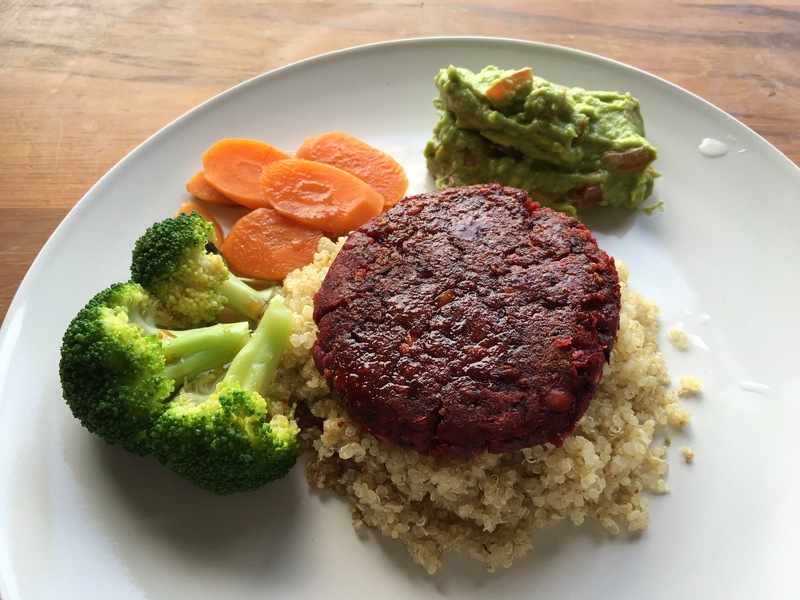 Here we have, beetroot cutlet with quinoa (pronounced as keen-wah). In case you are wondering whether quinoa is a form of carbo, it is not. Quinoa is actually a seed but can be prepared like whole grain such as rice. 1. Blend the oats until it resembles powder and set aside. 2. Put the chickpeas in a blender and pulse coarsely. Add in the beetroot and pulse again. 3. Combine all the ingredients and mix them thoroughly. 4. Form 4 patties, depending on desired size. 5. Pan fry it for about 10 mins on each side. Use medium heat. P.S. I only use 2 patties for my Husband and myself. The rest of the patties can be kept in the fridge for 3 days. 1. Bring a pot of water to boil and add one teaspoon of salt. 2. Add the carrots and cook until almost soften. Then add the broccoli to the same pot of water. Cook until broccoli is soften. 3. Remove the vegetables from the pot. The most exciting part is to place everything on the plate and make it look appetising. P.S Guacomole is prepared before hand.